An organization is only as effective as its processes. 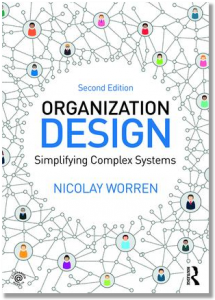 So when we design the formal structure of an organization, it should improve rather than obstruct process performance. But all too often, the structure and the processes are poorly aligned. Accountability for process performance is blurred. Multiple layers of managers slow down decision making. Activities that should be tightly integrated are instead separated. How can we avoid this? In this video, I describe one approach. “Marketing and sales – should they be grouped together or should they remain separate (and report to two different managers)? Should we outsource manufacturing (and by implication, separate it from engineering, which is still going to be internal)? Should customer support and sales be integrated? Although the tool itself is simple – it is just a 2×2 diagram – it summarizes a large body of theory and research on organization design. The principle behind the diagram is powerful yet frequently neglected. The purpose is to ensure that the formal structure (in particular, the boundaries between units) matches the resource and information flows. This is the third video in my series about “five organization design ideas that may change the world”. You can view the previous two videos here and here. P.S. If you want more information about this approach, consult chapter 5 and 7 of my book (see particularly page 168).